“Wild Coast. 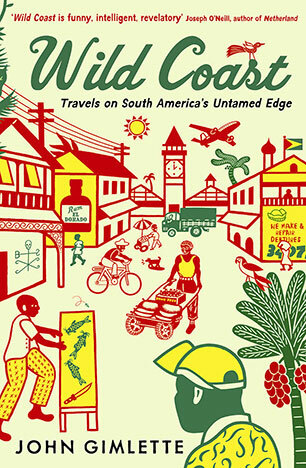 Travels on South America’s Untamed Edge”, by John Gimlette, Profile Books | Are we there yet? ← La Amazonia No Se Vende. Guyana, Suriname, French Guiana: raise your hands if you can recite, by heart – and no Googling, I can see you – their capitals. Not a clue? Well, I honestly doubt there’ll be many, amongst the few who’ll stumble across this, to know them. Because, frankly, how many of us have ever pored over maps depicting the coastline that sort of prevents the Caribbean from spilling into the Amazon, and thought Mmmh, I wonder what’s happening over there? Not many, I guess. Ah, by the way, it’s Georgetown – Paramaribo – Cayenne. The capitals, I mean. Anyhow, a fine chap called John Gimlette had. Wondered, I mean. And not only he has, but he also decided to get down there and have a look around to see what’s what. The result is a gem of a book, flamboyant in his cover (the UK edition I have features a delightfully naïf street scene on the front and a lush forest one on the back). In it Gimlette – who, it must be said, has a flair for obscure destinations and irresistible titles (Theatre of Fish, At the Tomb of the Inflatable Pig) manages not only to introduce these three rather unknown countries (well, two-and-a-half, French Guiana is still very much French) but also does it in such a way that it’s impossible, once you put Wild Coast down, not to feel a bit miffed that these countries never crossed your radar, because quite a lot had happened there. In facts, the more I ventured into the book, the more it felt as if this forgotten corner of the world had scooped up whatever weird, tragicomic and outright scandalous happened in the rest of the globe, sprinkled it with LSD and then doused it on itself with gay abandon. Faced with such a cornucopia of oddities, the average writer’s legs would shiver, the hands would turn as wobbly as raspberry gelatine and his otherwise orderly prose would get as tangled and babbling as Donald Trump’s delivery any time he needs to put two sentences together. Not Gimlette, though. His true gift, something I’d give a leg to possess, is the capability of mixing the past – with its history packed with incompetent adventurers, homicidal planters, doomsday cults, rioting slaves, imported communities of Vietnamese montagnards and much more – with his own adventures, jumping effortlessly from the history of maroon communities in Suriname to his own visit of these elusive villages. All without sounding like a boring git. For months, intrigued by the tale of a distant relative who set off from Western Canada to basically rot alive in an unknown river in Guyana, Gimlette hoofs and hops along roads, mud tracks, rivers and turbulent air, following Welsh immigrants in the Guyanese outback, stalking warring tribes along the mysterious Surinamese rivers and poking even into the heart of darkness of the French republic, a system of prisons so dire that even Lavrentiy Beria would’ve said “Well, that’s a bit rich”. Interspersed are interludes in cities that could be as joyful as postal cards from the Dutch Antilles, or as rough as a tropical version of a Western frontier outpost, but always, regardless, interesting. The result is a book as colourful as its cover, as entertaining as it is instructive, effortlessly erudite, ironic but also supported by a decidedly strong moral compass. The little biography on the author says he lives in London and practices as a barrister; well, this might be a first for me, but John Gimlette is the only lawyer I’d like to be sitting next to on a train or flight and hope he’s in a chatty mood. This entry was posted in Books review and tagged At the Tomb of the Inflatable Pig, Barrister, Books, Cayenne, France, French Guiana, Georgetown, Guyana, Hmong, John Gimlette, Jonestown, Korou, Maroons, Massacre, Montagnard, Netherlands, Papillon, Paramaribo, Planters, Profile books, ravels on South America’s Untamed Edge, Surinam, Suriname, Theatre of Fish, Travel literature, Wild Coast. Bookmark the permalink. I think I found my next book! Lol. Ha! By the way, how was Out of Steppe? It was absolutely fantastic! Loved it! I learnt a lot, and it’s just whetted my appetite to try and get to the region sooner rather than later. I don’t know how with a 5 year old though! He writes really well, it was an easy read, but informative and interesting. I’ll definitely be passing it on to other friends who are interested in Central Asia. Cheers mate! Due to the historical connections between Indonesia and Suriname, the latter is actually quite well-known here. Thanks to the Dutch who brought Javanese slaves to the South American colony, today there’s a considerable amount of Javanese people living in modern-day Suriname. Our former dictator for 32 years who was Javanese even visited Suriname a few times, and he always had an audience with the Javanese community there where he would just speak in his native tongue. I myself am Javanese and Suriname is definitely one of those countries I’ve been dreaming to go to. Yeah, there was a lot of mention of Javanese, Indonesians and South-East Asian at large in the book, especially for Suriname but also for Guyana. Quite interesting, frankly. Hi Fabrizio- I knew the capitals 😁These places have managed to remain so offbeat that I’m still intrigued by them. I lived for many years in another French colony (New Caledonia) so I know a bit about French Guiana because people tend to move from colony to colony. The book sounds fascinating. Get any ideas for your next voyage? 😉 They are very expensive destinations, at least French Guiana is. Hey Julie, in fairness the bit on French Guyana is the one I liked the least. Perhaps because of that doggedly obstinate way of the French to try and Frenchify the colonies, or hints that les métros actually ran everything… anyhow, I think I’m more of a desert person I believe, so I’m still hellbent on finishing off the ‘Stans and then, perhaps… the Altiplano. Maybe next year. I knew one capital (impressive, eh? not really)! Steamy places like this are ones I like to read about but not necessarily visit. Sounds like a fascinating book, though, and Bama’s comment intrigued me. Well Lexi, the book is just one – well, a few more but you get the idea – clicks away, or a visit to the bookstore away! It is a really interesting part of the world and I for once I’m hopeful that Bama gets there, it’d be nice to see what he thinks! Hey there! Neither did I, frankly, and there’s a lot more. Indian entrepreneurs, Javanese workers, runaway slaves… The Pig is also on my “to do” list!